Sunday School Shepherding: Revamp, Disband, Persevere? While we often think of Sunday School as the teaching arm of the Church, it can be so much more when also seen as a venue for shepherding ministry. But first, let's ask some question about the state of Sunday School today. So, what about Sunday School? While great potential exists for Sunday School, many churches struggle. With attendance on the decline and recruitment of teachers getting harder, many churches question what to do about Sunday School. Should they disband it, revamp it, or just persevere? Some churches have disbanded Sunday School altogether. Some have tried to give it a face lift by changing its name and/or making it more of a fellowship time. Others are just limping along. Yet, some do continue to see growth. What's wrong with Sunday School and what's the solution? If the problem with Sunday School is a matter of relevance, why not revamp the curriculum to make it more relevant? Why not add some methodology that brings it up to the 21st century? Why not do a better job of helping students understand how truth relates to life? If the issue is a shortage of workers, why not restructure to accommodate your teacher-student ratio? Why not think outside of the box and delegate responsibilities of the Sunday School time to a variety of people for that which is more in line with their gifting, interests, and busy lifestyles? If low attendance is the problem, why not work to rekindle the passion for Sunday School? Why not help people understand the importance of it? Why not pour everything into those who do come so they become disciplers themselves and assist in the multiplication process? In reality, solutions do exist but it takes much effort and perseverance. You need to be willing to start where you are rather than begrudge where you are. You need to work at attracting people rather than repelling them. You need to be ready to answer why you should have Sunday School rather than why you should not. If not Sunday School, then what? Where will this kind of teaching and shepherding ministry happen? If you minimize or dismiss Sunday School altogether, where else will you offer the kind of teaching, fellowship, and outreach/ministry provided by a Sunday School class? How will you offer the dynamic of a mid-size group if you discontinue Sunday School? What will be your alternative for interactive, systematic teaching? What will be your alternative for assimilation? What will be your alternative for outreach/ministry? Sunday School, one structure of the church, has the potential to fulfill all of these objectives in just one setting. If you stop Sunday School will you find yourself adding more programs to accomplish all of this or will these objectives be neglected? In addition to the content on this page, the Shepherding Ministry Manual provides some brief thoughts about the above three bulleted questions and also asks you some questions to reflect on improvements you can make to church's Sunday School ministry. Most of the churches with thriving Sunday Schools are those that use Sunday School as an outreach arm of the church, as a means of systematically discipling people, and as a way to assimilate people into the church. Sunday School thereby provides a starting point for shepherding people. But, it will take teachers who are willing to do more than simply show up on a Sunday morning and teach the class. 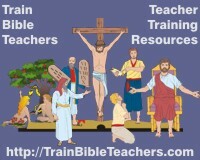 What's the role and qualifications of the Sunday School Teacher? How can a busy Sunday School teacher to do it all? What about Sunday School students and the teacher's relationship with them? What is Sunday School's greatest resource? So, You Were Asked to be the Sunday School Superintendent!